Update: this is now a regional tag for just South Orange County: Irvine and south-east of it. Tustin to Newport Beach, and everything north-west of it are on their own. Split it up as you see fit. * The boundaries are within Orange County, CA, and up to 25 miles into the neighboring counties. 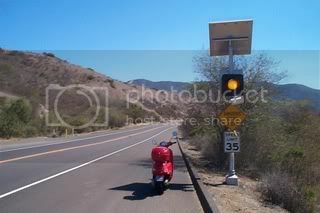 * To start, someone posts a photo of their scooter with a landmark, sign, etc. Clues may be given along with the photo. I'll start below. * Individually other participants ride to the same place and get a photo with THEIR scooter at the same/similar spot. * The first person to "tag" the photo by posting their photo with their scooter gets to post the next photo for people to find. * If no one is able to identify the tag, the poster can give progressively easier clues until someone finally says "AHA!" though please don't post the location of the tag until after someone else has tagged it. The hunt is part of the fun. Clue: You better adhere to the speed limit! What does the width of the bike lane tell you? 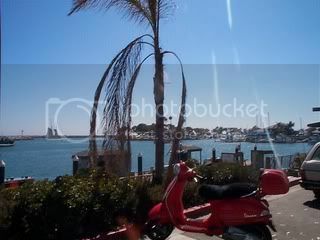 Yes but I am not gunna ride way out there (biker bar) to take a pic of me and my scooter. Sorry, but there is no biker bar anywhere near it. Actually, you'll be wearing a safety vest, a FF, and boots, when you approach this sign. I gotta wait till a closer one. Yeah, you're both onto something. I know this place too! Okay, same question from me: is anybody attempting to get there? If not, I'll do something easier by tonight. it is a surprisingly peaceful place--most of the time. And I wonder why they even bothered putting up that sign. There aren't many cars out, ever. I can get there - but not 'till Sunday. That's cool. Sunday is just the day after tomorrow. We can wait. This is not an easy place to find. Good luck! Sorry, Face. Beatcha to it. How about a more scenic ride to the next locale? This looks so familiar but I just cant figure it! Yet! I go this one in the bag tonight! You now have the honor of picking the next location for someone to find. here is my pic. best of luck. Really? A Barbie scooter counts? Its been there since 1929, thats your clue. The street sign would have blown it completely. Not only did it name the intersection, it had another sign saying " ______ This Way"
There, I got rid of the name also Andrew. Is that what you meant? The name was too telling? No big deal either way, just a comment, its your photo tag, and its still fun whether its easy or hard. No you were right, I just didnt get it at first and then thought DUH< net search for the market name lol, thanks. I got a different one that was a toss up with this one but maybe its a funner shot. And a really nice ride if you take the right route Face. Say you get the last picture and now it's your turn to post the next location. Does your next location picture have to have been taken After the previous picture or can it be an older picture of some time you happend to have taken a picture of your scooter in some location? i.e. 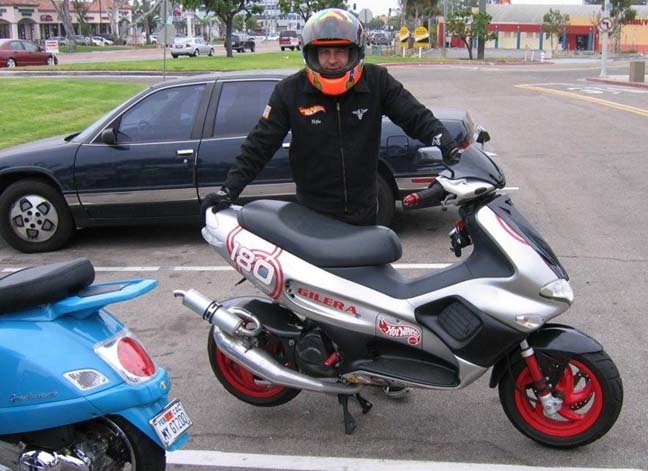 I have a picture of my scooter taken in front of the Monterey Aquarium from last year and post that after winning the last location. Should be a new photo if at all possible. If you want to bring the game to a halt, post the Monterey Aquarium, although someone here will post a reply, their next image may be unattainable. I've started a rules thread for discussion so we can get something more firm. 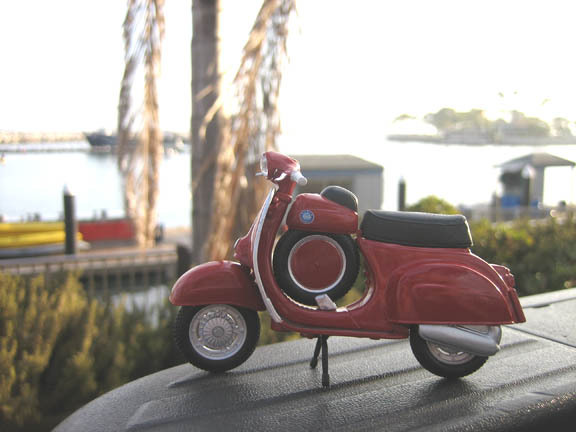 Im sorry, I didnt mean to say posting Monterey would ok, just that I had a old shot of my scoot in Monterey as an example. I do realize its OC tag. Ok so anyway you guys seem to agree the pic should be new not out of the archives. Hey Petrol, good job figuring out the Tower Records location. I would have never got that one. I know where your market is - in my old neighborhood. I've been waiting for FaceMechanic to get it. He seemed so disappointed to post his photo of Dana Point Harbor after Nyle. I'll wait another day or two. As far as the rules / guidelines for the game, RitchJ started another thread. Maybe you could take a look and give some feedback there. Glad to see other enthusiastic scooter tag players out there. Let's keep it going! Whatup? I want to get the next one in OC tomorrow and then hit a San Diego one on Sunday! Okay, Ill just try for an OC and a SD both on Sunday!